Planning birthday celebrations overwhelm me a little bit! Don’t get me wrong, I love Pinterest and party inspiration but it’s just too much for me! We like to keep our birthdays fun but simple! Our typical birthday routine is balloons and a donut cake with candles! This year, I wanted to try something new! I’d connected with Sign Gypsies on Instagram and thought this would be a unique surprise! Sign Gypsies customize what type of signs you’d like to have-birthdays, anniversaries, graduation. We were able to select the colors we were interested in and my son loves sports, so we added a basketball, football, baseball and some other characters. Sign Gypsies will arrange a time to set up the greeting and pick everything back up 24 hours later! 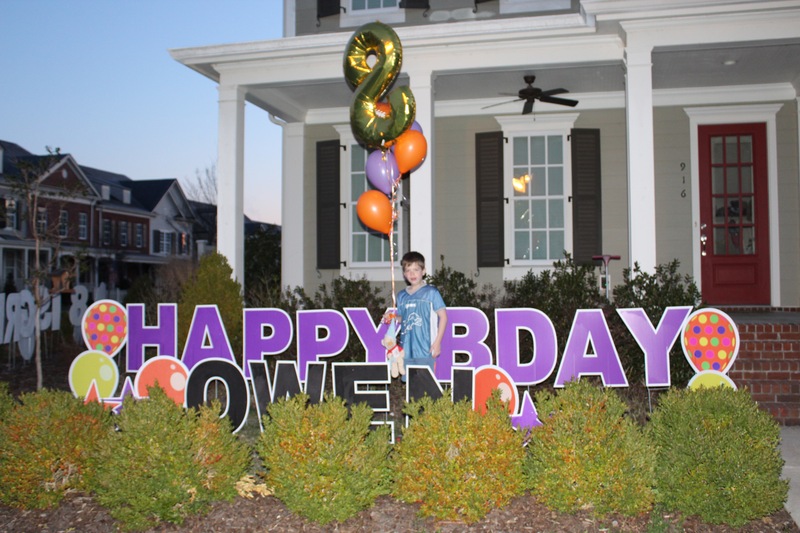 I literally could not wait for Owen to wake up so I could show him his birthday messages! So many friends and neighbors loved the idea too! I think this will become part of our new celebration tradition! I highly recommend this service, easy to work with and makes for a really great birthday morning!